The Group of Seven serves as a forum for highly industrialized democracies to coordinate economic, security, and energy policy, but the Trump administration has provoked questions about the group’s cohesion and relevance to global governance. The Group of Seven (G7) is an informal bloc of industrialized democracies—Canada, France, Germany, Italy, Japan, the United Kingdom, and the United States—that meets annually to discuss issues such as global economic governance, international security, and energy policy. Proponents say the forum’s small and relatively homogenous membership promotes collective decision-making, but critics note that it often lacks follow-through and excludes important emerging powers. Russia belonged to the forum from 1998 through 2014, when the block was known as the Group of Eight (G8), but was suspended following its annexation of Crimea. 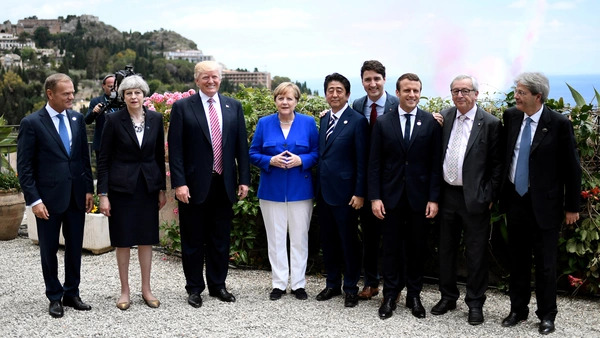 The G7’s future has been challenged by continued tensions with Russia, disagreements over trade and climate policies, and the larger Group of Twenty’s rise as an alternative forum. Meanwhile, U.S. President Donald J. Trump has deepened divisions within the bloc, raising questions over cooperation on various policies. France, Italy, Japan, the United Kingdom, the United States, and West Germany formed the Group of Six in 1975 (Canada joined the following year) to provide a venue for the non-Communist powers to address pressing economic concerns, which included inflation and a recession sparked by the OPEC oil embargo. Cold War politics invariably entered the group’s agenda. The European Union has participated fully in the G7 since 1981 as a “nonenumerated” member. It is represented by the presidents of the European Council, which comprises the EU member states’ leaders, and the European Commission, the EU’s executive body. There is no formal criteria for membership, but the participants are all developed democracies. 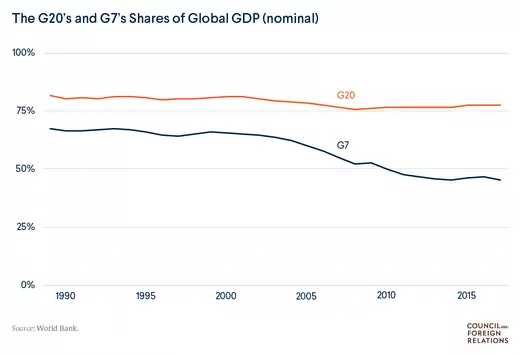 The aggregate gross domestic product (GDP) of G7 member states makes up nearly 50 percent of the global economy in nominal terms, down from nearly 70 percent three decades ago. Unlike the United Nations or the North Atlantic Treaty Organization (NATO), the G7 is not a formal institution with a charter and a secretariat. The presidency, which rotates annually among member states, is responsible for setting the agenda of each year’s summit and arranging logistics for it. Ministers and envoys, known as sherpas, hammer out policy initiatives at meetings that precede the gathering of national leaders. Unlike the United Nations or NATO, the G7 is not a formal institution with a charter and a secretariat. Russia formally joined the group in 1998 after partially participating in prior years’ summits. U.S. President Bill Clinton thought that admitting Russia to the exclusive club would lend the country international prestige and encourage its first post-Soviet leader, Boris Yeltsin, to consolidate democratic gains and hew more closely to the West. Clinton also believed that membership would help mollify Russia as the NATO security alliance opened its doors to former Soviet satellites in Eastern Europe. But Clinton’s decision to include Russia drew some pushback. Finance ministries were wary of coordinating global economic policy with Russia, which at the time had a relatively small economy and large public debt. The ministerial track for finance continued to meet as the G7, even as leaders and foreign ministers convened as the G8. Russia’s backsliding toward authoritarianism under President Vladimir Putin has underlined the disjunction between Moscow and the other members. Russia held the G8 presidency for the first time in 2006 and once again in 2014, though the latter effectively lasted only a few weeks, as Moscow’s annexation of Crimea in March 2014 drew swift censure from its peers. “We will suspend our participation in the G8 until Russia changes course and the environment comes back to where the G8 is able to have a meaningful discussion,” the G7 leaders said in a joint statement. The decision of the seven other members to pull out of the planned 2014 summit in Sochi, Russia, and meet instead as a reconstituted G7 in Brussels was little more than a symbolic diplomatic step, many analysts say. The measure was “basically a reprimand saying you're not in our club, you don't meet certain standards of international behavior, much less domestic behavior,” says CFR’s Stewart Patrick. The standoff between Russia and Ukraine has persisted. As conflict between Ukraine’s military and Russia-backed rebel forces in eastern Ukraine intensified in 2014, the United States and European Union ratcheted up sanctions in an effort to further isolate Russia. While the G7’s European members did not initially join the United States in sanctioning several prominent Russian businessmen, the political calculus shifted in July 2014, when Malaysia Airlines Flight MH17, en route from Amsterdam to Kuala Lumpur, crashed in eastern Ukraine, apparently hit by antiaircraft missiles fired by the rebels. The deaths of all 298 passengers, mostly Europeans, hardened the EU’s position against Russia, and on July 30 the G7 announced an expanded set of sanctions. “Regrettably however, Russia has not changed course,” the leaders’ statement read. In September 2014, the United States and the EU again tightened sanctions on Russia, including restrictions on major Russian financial, energy, and arms enterprises. As Russia fell into a deep recession in 2015, G7 leaders tied the lifting of sanctions to the implementation of the Minsk accords, a peace plan that called for a cease-fire and the withdrawal of heavy weaponry from eastern Ukraine. The Minsk agreements have been largely ignored, and Russia announced sanctions of its own against eighty-nine European officials in May 2015. The Russian economy has gradually recovered, returning to growth, albeit dragged down by persistent sanctions and volatile oil prices. The Ukraine conflict has hardened into a standoff, with the country’s easternmost provinces under de facto Russian control. Tensions have also risen over Russia’s role in Syria, especially in the wake of chemical attacks linked to government forces, as well as mounting evidence of Russian interference in U.S. and European elections. In May 2017, German Chancellor Angela Merkel met with Putin and indicated that EU sanctions would continue indefinitely. However, divisions emerged within the G7 over a 2017 proposal to impose fresh sanctions on Russia, which ultimately failed. And in 2018, President Trump shifted course and called for Russia to be readmitted to the group. Experts hoped that the reconstituted G7 would have the potential to better facilitate collective action. Without Russia, the group was more “like-minded and capable,” said CFR’s Patrick, with both common interests and common values. However, Trump has undermined G7 unity on a number of issues, with trade and climate chief among them. In comments surrounding Trump’s first trip abroad as president, which included the May 2017 G7 summit in Sicily, the distance between his administration and the rest of the bloc was laid bare. In Brussels for a NATO summit, Trump criticized Germany’s trade surplus and threatened to block U.S. imports of German cars, sparking an angry reaction from Merkel. European allies balked at Trump’s stance on NATO after he accused them of not spending enough on their own defenses and refrained from endorsing the alliance’s mutual-defense provisions. The following year’s G7 summit in Charlevoix, Canada, proved still more difficult. Ahead of his arrival, President Trump wrong-footed his counterparts by calling for Russia’s readmission. The group eventually cohered around a final communiqué, but Trump rescinded his endorsement of it minutes after his departure, angry that Canadian Prime Minister Justin Trudeau had said Canada would “not be pushed around” by the United States at a closing news conference. Meanwhile, European leaders must also contend with a laundry list of economic challenges, including promoting economic reforms throughout Europe, resolving ongoing debates over budget deficits, navigating the United Kingdom’s withdrawal from the EU, and maintaining cohesion during a period of rising nationalism. In addition to its internal divisions, many analysts note that the G7’s voice is not as influential as it once was. Many analysts believe the power and prestige of the Group of Twenty (G20), a forum for finance ministers and central bank governors from nineteen of the world’s largest countries as well as the EU, has surpassed that of the G7. Emerging powers such as Brazil, China, India, Mexico, and South Africa, whose absence from the G7 was often noted, all belong to the G20. Russia remains a member of the G20, which, Patrick says, “is much more where they belong.” The group’s member states represent about 80 percent of global GDP and two-thirds of the world’s population. U.S. President Barack Obama affirmed this in 2011, calling the G20 the “premier forum for global economic coordination.” Many observers note that the forum was most effective during the 2007–2008 global financial crisis; G20 leaders first met in Washington in 2008, after the fall of Lehman Brothers. But as that sense of urgency subsided, multilateral consensus was harder to come by. 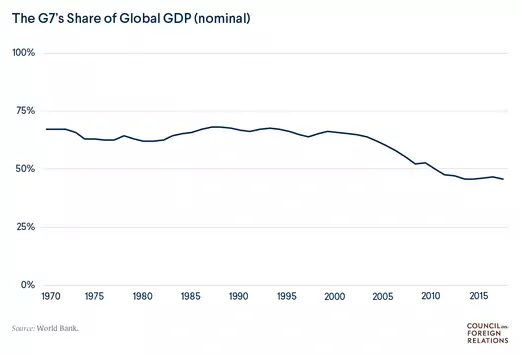 “We are now living in a G-Zero world, one in which no single country or bloc of countries has the political and economic leverage—or the will—to drive a truly international agenda,” wrote Bremmer and economist Nouriel Roubini in Foreign Affairs in 2011. Still, G20 summits have been the occasion for ambitious goals. At the November 2014 G20 summit, hosted by Australia, leaders adopted a plan to boost their economies by a collective 2.1 percent, which they did not achieve. In Hangzhou, China, in 2016, President Obama and Chinese President Xi Jinping used the summit to jointly announce their accession to the Paris Agreement. At the July 2017 meeting in Germany, however, the G20 ran into the same problems the G7 has come across in recent years, as countries proved divided by trade issues and the United States blocked a planned reference in the communiqué to the need to “resist all forms of protectionism.” The following year in Argentina, the G20 achieved what the G7 could not, releasing a communiqué that all its members agreed to. But as critics pointed out, this seeming consensus was only made possible by sidestepping disagreements on trade, climate change, and migration. This 2017 Associated Press report from Ukraine investigates the status of the conflict in the country’s east and the Minsk accords. The University of Toronto's G8 Information Center compiles primary sources from ministerial meetings and summits, analysis, and compliance studies. The UK Department for International Development compiled the most recent accountability report for the erstwhile G8. The Overseas Development Institute, a British think tank, critiques the official report's methodology. Ian Bremmer and Nouriel Roubini argue in this 2011 Foreign Affairs essay that the heyday of the G7 and G20 has passed. Bremmer revisited the argument in the New Statesman in 2013.